Using cutting-edge CNC technology Bernice Skoro and her design team offers you the ability to virtually "grow" a jewelry piece using Computer Aided Design (CAD). This technique offers you the ability to shape every aspect of your piece "virtually" and participate fully in the the design process. 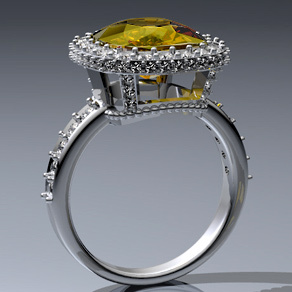 You'll be able to see 360 degree pictures of your ring, as it is being designed. Together with our skilled graphic designer, you will be able to see and make changes to your jewelry piece prior to its creation. Because the program utilizes the exact dimensions of the stones you select, the visual renderings will be proportionally accurate. The virtual renderings may often appear overly heavy, thick or too bulky. This is especially true with the prongs holding the stones in place. Our designers must leave extra metal for the setter to bend around the stone, securing it safely. The extra metal is then filed away presenting a much smoother, softer and more contoured appearance. The final piece is significantly thinner, more dainty, and more contoured than the rendering depicts. Please click here for our diamond or actual rings. All of our rings can be custom made in any precious metal, 14kt. and 18kt. white gold and yellow gold, platinum, and palladium.